HYM Investments illustrates how its Suffolk Downs property could host a second headquarters for Amazon. Amazon or not, the redevelopment of Suffolk Downs is kicking off in earnest. The developer, HYM Investment Group, submitted a letter of intent to City Hall Wednesday for a “new neighborhood” at the old horse track, totalling 11 million square feet of housing, office space, and stores over the next 15 to 20 years. 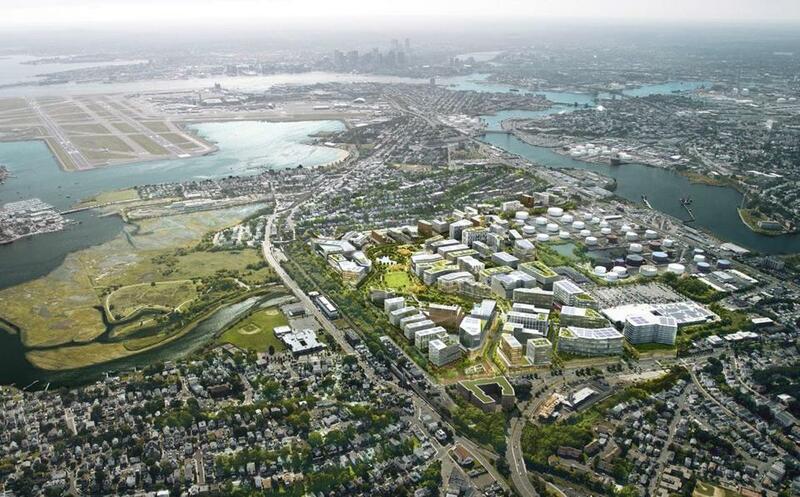 The letter formally launches a review of the project by the Boston Planning & Development Agency and comes after several months of meetings in East Boston and Revere by HYM to start garnering support. HYM, which is led by a former Boston Redevelopment Authority director, Tom O’Brien, bought the 161-acre site earlier this year for $151 million from the racetrack owners, who had lost their bid to put a casino there. The letter, a preliminary outline of HYM’s plans, envisions a mix of uses at the old track, with two “retail squares” — Beachmont Square and Belle Isle Square — that would be built near the two MBTA Blue Line stations at the edge of the property. It also outlines a 40-acre network of open space, including wetlands, which the developer hopes will make the low-lying site more resilient as sea levels rise. Suffolk Downs was tapped by Boston officials as the best site in the city for a potential second headquarters for Amazon.com Inc. HYM worked closely with the city on the proposal, which was sent to the tech-and-retail giant in October. Filing plans with City Hall now kicks off a process that could have the project permitted by mid-2018, in line with Amazon’s timeline for choosing a location for its second headquarters. It has launched a similar review in Revere, where about one-fourth of the property is located. HYM acknowledges Amazon might move faster than Boston typically does in authorizing large projects and says special permitting might be needed for the first building, of 500,000 square feet, which the company would want available by the end of 2019. But O’Brien has said that the Suffolk Downs project will go forward whether Amazon decides to move there or not.